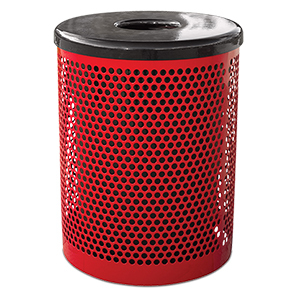 Maintain clean and inviting, litter free spaces with these 32 gallon perforated steel trash receptacles. Constructed with commercial grade, heavy duty 12-gauge steel with an impact resistant and UV stabilized thermoplastic finish. Popular for a wide variety of site applications, these receptacle bases can be outfitted with an array of options to best suit litter management demands; five lid styles, rigid plastic liners, cable lid attachments, in-ground and surface mounting kits.